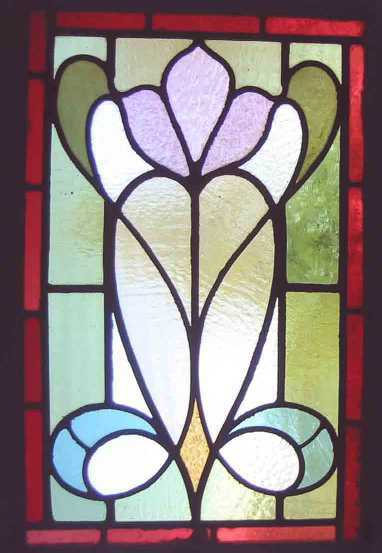 I HAVE 2 OF THESE WINDOWS PRICE IS PER WINDOW This beautiful art nouveau window is still in the original frame. A work of art to enhance any home and possibly a much undervalued investment. Of English origin from around the 1900s mark. The frame is in good condition and could be re used as a window. This old heavy glass picks up and softly diffuses the colour of the light falling upon it, frame measures 18"W x 30"H"
Inc sash feet of 3" which could be removed if required. The glass is 15" x 24" This Antique Window Shipped and packed to USA would cost $119. You can buy this now using the paypal link below the photograph or e-mail sales click here to arrange payment by personal check ,money order or bank transfer.